Cultivation. The steps you take to turn a prospect into a donor. These steps can range from sending someone a newsletter to a face-to-face visit and all manner of things in between. The trick, particular for larger annual or major gifts is to be deliberate and to make the step or move meaningful for that particular prospect. This last point really hit home the other day when working on cultivation plans with one of my clients. They have an upcoming fundraising event, and the director of development had put “invite to event” as the first step for every single prospect. Let’s talk about this, I said. Let’s see if this is really a good step. The first prospect on the list was a former—very former—large donor who had not been heard from (nor, I presume, had been approached) for over 5 years. In this instance, is an invitation to an event really a cultivation move? Do we have reason to think that this donor even likes events? One way to find out is to see if, when they were involved with the organization, they came to the fundraising event. How often? Did they buy tickets, tables, sponsorships? If they did come, are we inviting them to come again as a paying guest or a sponsor or are we inviting them as a VIP guest, seated at the table of the CEO or the Board President? The answers to these questions will begin to clarify if the event is a good fit for this prospect. For major prospects who are not currently involved with the organization, an invitation to an event unless it is as a special guest, seated at the right hand of an organizational leader(executive or board member), may not be the first step that will lead that prospect down the road to becoming a donor. The first step in this case would be to try to get a face to face meeting to gauge the person’s possible interest in your organization and to discuss what she hopes her involvement will mean. Yes, an invitation to an event may showcase your organization, but it often is a one-way conversation. And therein lies the problem with too much fundraising. We talk at our prospects, telling them how important our work is and how much we need their support. True cultivation is a two-way discussion and your job is to listen to your prospect about what matters to her. Not long ago I was working with a school that was focused on raising endowment. But endowment is not something that appeals to everyone, nor does it meet all the needs of the organization. One of their long-time supporters, a person with huge capacity and even greater inclination to support the school, made his views on endowment quite clear. Important, perhaps. Of interest—not to him. The development director was frustrated. She could not move him to make an endowment gift. Why, I asked, are you even trying? Stop talking about endowment and talk with him about his hopes and dreams for the school. What does he love and want to make better? What does he wish you had and might be willing to fund? They (finally!) stopped inviting him to events touting the importance of endowment and acknowledged that deferred gifts were not the only priority for the school. In one on one meetings, they found out what he cared about, how his family makes decisions (and realized that they had never received a really large gift because they left important people like his wife and his brother—who knew?—in the wings), and what sorts of recognition made his heart beat faster. The upshot? Over time (and major gifts are rarely one and done), he made a 7-figure gift to start and support a new program, named for his father. And, by the way, after the program was up and running, he was so pleased with the results, he announced a deferred gift to yes, endow the program and ensure its continuity. Janet Levine helps nonprofits increase their fundraising capacity. 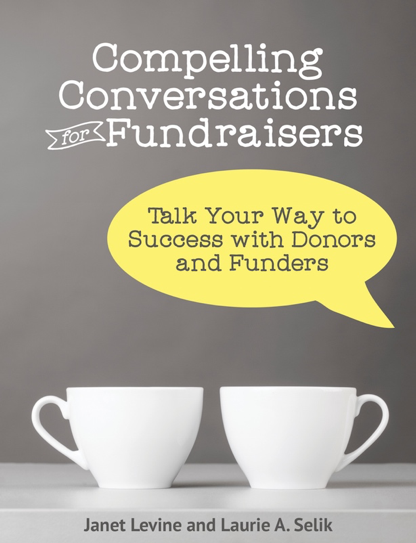 Contact Janet at www.janetlevineconsulting.com, and learn how she can help your organization fundraise more effectively. This entry was posted in fundraising and tagged Ask, consistency, cultivation, Endowment, events, fundraising, major donors. Bookmark the permalink.